Hope is the most reliable sustainer of life. It offers the promise of something good in the future, contributes to resilience, and keeps one going. However, there are circumstances when hope dries up. This book seeks to map out such dark terrain of hopelessness. While it allows for the fact that a modicum of hopelessness might help in reducing infantile omnipotence and curtailing fixation on unrealistic goals, its focus is upon severe and clinically significant shades of hopelessness. 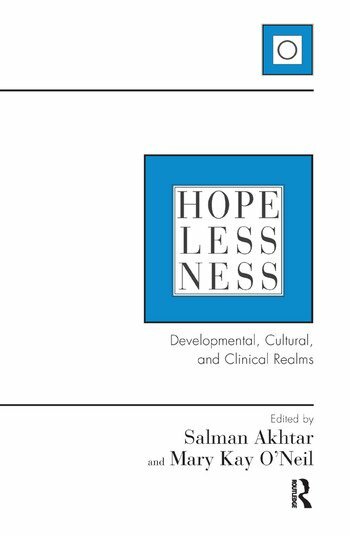 The book opens with a broad overview of the nature, developmental origins, and technical implications of hope and hopelessness, and closes with a thoughtful summary, synthesis, and critique of the intervening essays; this summary forges both theoretically and technically significant links between the experiences of helplessness and hopelessness. Sandwiched between these opening and closing commentaries are nine essays which address the ontogenetic trajectory, phenomenological variations, cultural and literary portrayals, and clinical ramifications of sustained hopelessness.